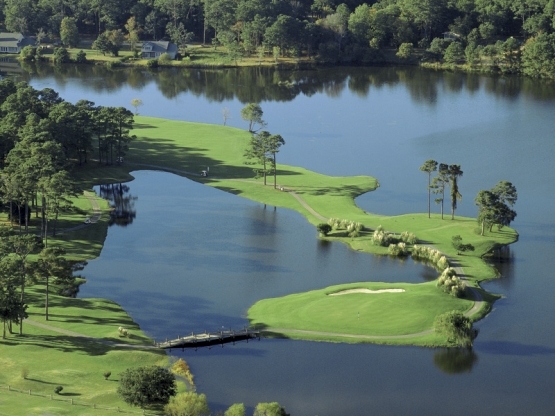 Oyster Bay Golf Links, located in Sunset Beach, N.C., has been a favorite Myrtle Beach golf course with locals and tourists alike since its inception in 1983. Renowned golf course architect, Dan Maples, designed a fun but challenging golf course with Oyster Bay. This award winning Myrtle Beach golf course features holes along beautiful saltwater marshes, pristine fresh water lakes, two par-3’s that have island greens, undulating greens surrounded by deep bunkers and outstanding Myrtle Beach golf photo opportunities. Playing to a par-70, Oyster Bay has some lengthy par 4’s and the strategic layout can test the shot making skills of all golfers. Oyster Bay is just a few minutes from North Myrtle Beach which makes it convenient to all that North Myrtle Beach attractions. North Myrtle Beach is home to some of the finest hotels, condos and ocean-front beach houses. Myrtle Beach golf packages offer the very best in Myrtle Beach golf deals that can include Myrtle Beach golf lessons with a renowned Myrtle Beach golf instructors. North Myrtle Beach is also home to two fantastic Myrtle Beach golf retailers. The PGA Tour Superstore and GolfSmith offer the finest in the latest golf equipment such as Titleist, TaylorMade, Callaway and Ping. The latest golf apparel is also available to ensure that you will be styling on your Myrtle Beach golf vacation. A walk on the white, sandy beaches in North Myrtle Beach while enjoying the mild Myrtle Beach weather is a must do on your next Myrtle Beach vacation. Book your Myrtle Beach golf package today! The course had been aerated and the greens had so much sand you couldn't putt. The local rule was a two putt on those holes. I didn't think the course was in great shape. I would like to play it again when it is in good shape. This course is a gem with some very strong holes. The difficulty of a hole doesn't need to be its length and this is where Oyster Bay comes up trumps with its use of its natural hazards. The par 3s are all memorable and the alligators add to the courses intrigue. The pace of play was very good and the staff are very pleasant and helpful. This is definitely a course that we will play again (and again).